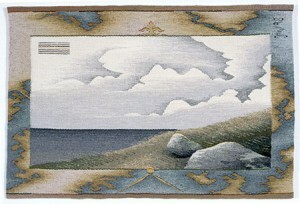 I had a client who wanted me to do a tapestry of the view from his home. I get that a lot. Julia Mitchell lives on Martha’s Vineyard, where her roots go back several generations. 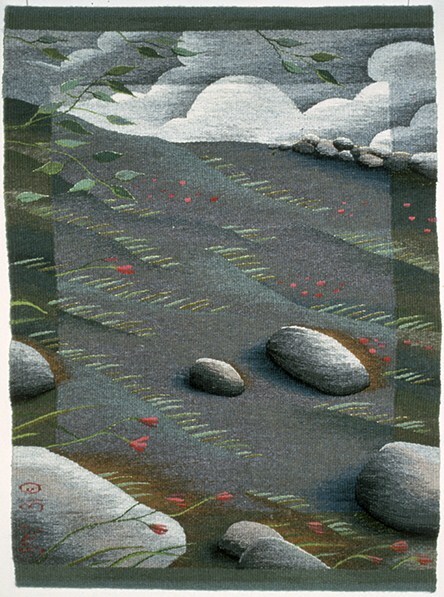 In her career, which itself goes back to the 1960s, she has produced over 160 tapestries; she has received numerous commissions. In the view were stone walls. He said he wanted [me] to add some stone walls. So I said, Fine. My working drawing was beautiful, I thought. He looked at it and he said, That doesn’t look like a stone wall, you know. You ought to go out some time and really look at a stone wall. The potential client was clearly frustrated that the stone walls that I had done were based on my idea of stone walls, not his. At least one question is raised by the challenge to Mitchell’s stone wall. Does the person paying for a commission assume that a weaver will not have her own sense of what makes an image work, that the weaver’s job is to render an objective reality, not create her own idea of stone walls? 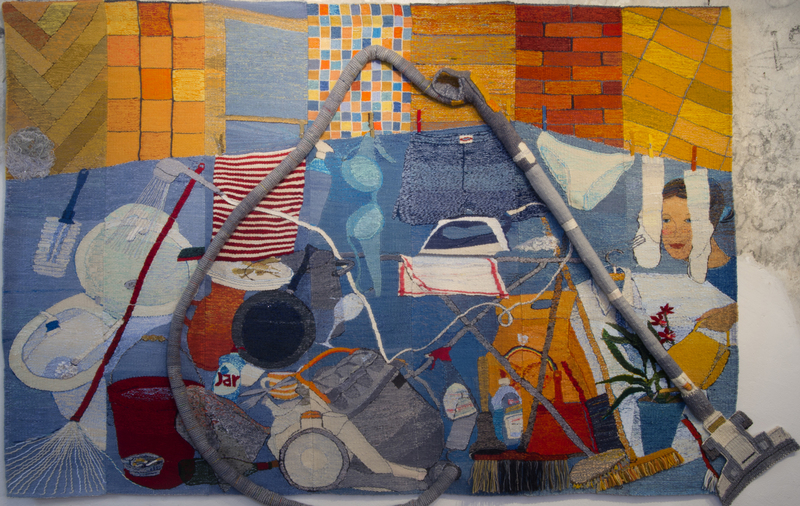 In short—did the person commissioning really want a Julia Mitchell tapestry? Stone walls actually work well as a starting point for a discussion of tapestry in general and Mitchell’s work in particular. 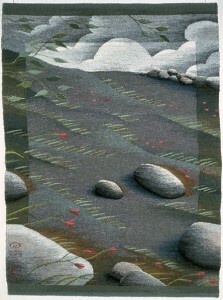 The beginning lessons of anyone learning tapestry techniques include the realization that you cannot weave over what you haven’t woven under—you cannot lay a stone, or a thread, in its place in the construction of a wall—or a piece of weaving—if you do not have the foundation in place to build it on. 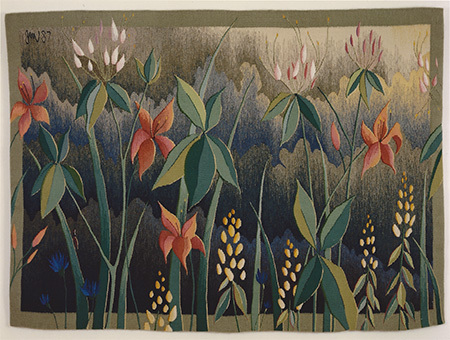 Julia Mitchell’s formation as a tapestry weaver began when she was in her teens and hated her public high school. One day she wandered into the guidance counselor’s office. I went over to his bookshelf and pulled down that little book of private schools. I said, Mind if I look at this? He said, No. I picked it up…paged through it, put my finger on [an entry] and said: I’m going there. She was pointing to the Windsor Mountain School in Lenox, Massachusetts, at the other end of the state. I got somebody to drive me out there, in the summer, when it was already too late to apply. Something took over in me—sometimes life is just set out for you. I said, Here I am. I want to go to this school, I don’t have any money, I’m a straight A student and I could do a lot for you. You’re going to be really happy if you let me into your school. And they did—and they gave me a full scholarship. Mitchell had grown up in a family that viewed a life in the arts as a reasonable choice—as responsible as a life working in any other field. She spent her childhood drawing and looking through all the art books around her home. At her new school, she signed up for a class in Art History—and met Edith Reckendorf, a teacher who had Bauhaus training in her own history. The very contented two years that Mitchell spent at Windsor Mountain derived, mainly, from her immediate connection with this one teacher as Reckendorf’s influence, mentoring and friendship became major influences. I just took all of her classes. These included weaving and design. Perhaps an odd small thing also helped—Reckendorf’s English, while just fine was heavily accented. Mitchell would say that she learned better because of it: She taught in a non-verbal way…She would just strew the table…with clippings, pictures, articles, examples of what she was going to be talking about that day. She was so well prepared…she would show these slides and she would point to various aspects of them and we would be riffling through all this stuff…It would be up to us entirely to figure out, to make our own, to draw our own conclusions from what we were seeing. She taught us how to be meticulous in the craft and very thoughtful about how the fiber was working in our hands. Listening to it. Getting it to do what it was meant to do, rather than forcing a design on top of it. Anni Albers was one of the first artists Mitchell came to appreciate through Reckendorf. [Albers’] whole approach to design is fresh and simple: form following function, no decorative frills, letting the materials do what they want to do, letting the design flow organically from the materials. All of which brings this discussion back to the stone wall. What do we think about the nature of the wall? 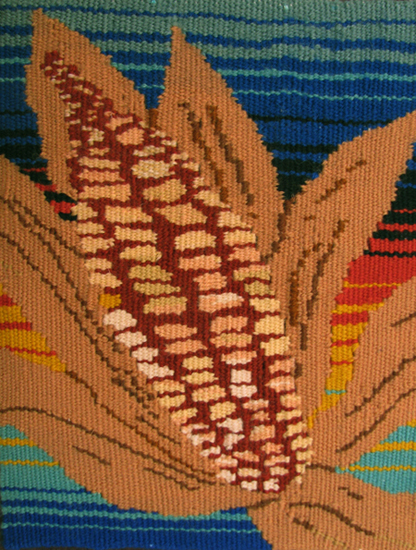 How do we understand the construction of a tapestry? Among their numbers, tapestry weavers count those who think of the seeds of tapestry weave, one weft crossing over one warp, as a form of pixel. If the pixel forms the basis of the design process, then anything that can be visually represented can be woven in a tapestry—and why not? Those weavers push the medium to fit their visual expectations. They work regularly with cartoons derived from media like photographs or paintings. By contrast, Mitchell is specifically always looking for that which she considers weaveable. 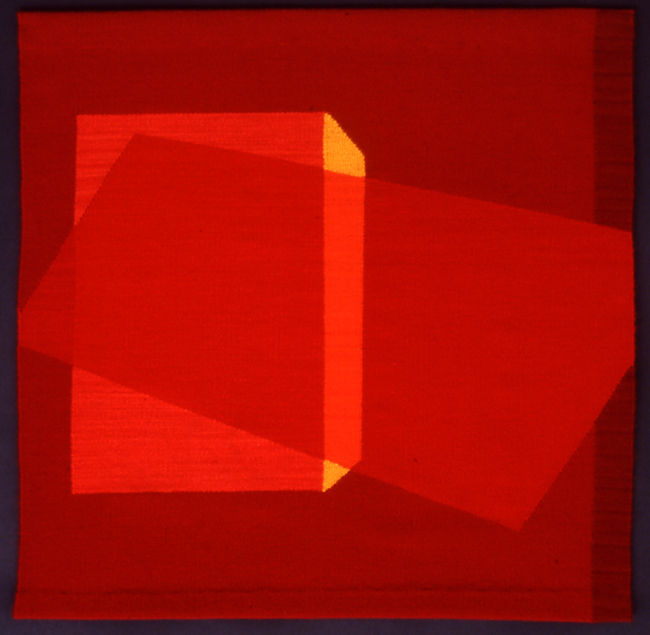 I didn’t study designing for tapestry, for instance [though she has done some work with Yael Lurie during years she lived in San Francisco]. I know what the limits of the medium are and I really try to design so that…the materials do what they do best. I try not to wrestle them to the ground. When pressed for what they do best, Mitchell says, Lean into each other. Eccentric wefts. A lot of hatching. Color wash that none the less reveals the technique. She adds, I like the technique to show. I like the little bumps that occur when you weave from the front and do a single interlock, I’m not looking for a perfectly flush surface in my work. And, she adds, I’m not trying to weave a daisy when you could just as easily weave an iris. Only by thinking carefully about the iris and the daisy does the meaning of this statement get teased out. The daisy’s dominant characteristic is individual petals, going in all directions. 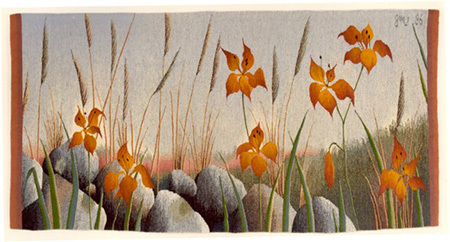 An iris has gentle curves, a group of gestural movements. 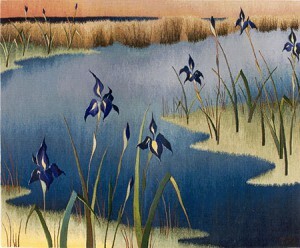 Mitchell has done numerous iris tapestries. 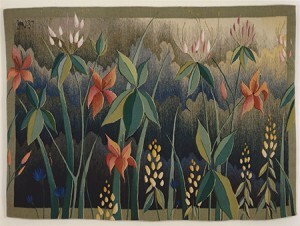 She often prepares her designs with a Sharpie pen, and thus can end up sometimes with a cartoon comprised of a series of lines that reinforce her idea of what is suitable for weaving. She is not only pursuing her own esthetic of the stone wall—she is consistently making those shapes which define and remain true to her sense of the medium. This means, to put it succinctly, that, like the process of weaving, Julia Mitchell’s got rhythm. 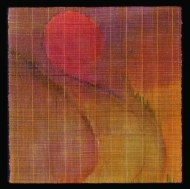 From the beginning, the learning of weaving had led her directly into tapestry. She says, I couldn’t get from one selvage to another. I just kept turning the color around. Building up images in a very eccentric way. There were no straight lines about it whatsoever. The tapestries out of the Wassa Wissef workshop in Egypt, whose images were just then reaching the United States via books after early exhibitions, became another major influence. [Those tapestries] are nothing if not eccentric. I just began to draw with the fiber. 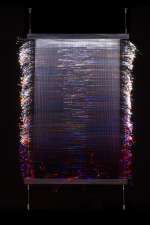 She describes the actual work of design as agonizing [whereas] the weaving part is a joy—it just comes flowing out of me. [But the design] takes a really long time. I start with thumbnails and I just mess with them and mess with them and then I remember them and go back to them. It takes forever to get a design together. It takes years sometimes. I do these little drawings and then they morph into other things. Rhythms fill her work. The grasses swing, the irises sway in soft breezes, the waters pool, the currents eddy back and forth, clouds float through the sky. Mitchell’s weaving seems to mirror her movements on the loom. Back and forth goes the weft yarn with its thread tailing after it, moving into the interstices, the spaces between the warp threads; back and forth go the rhythms of her tapestries. 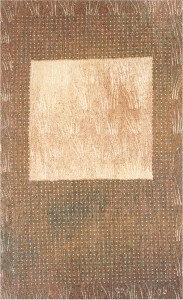 Looking at a piece from the early 1980s, for instance, Field Blowing, one sees the central image with a border around it. 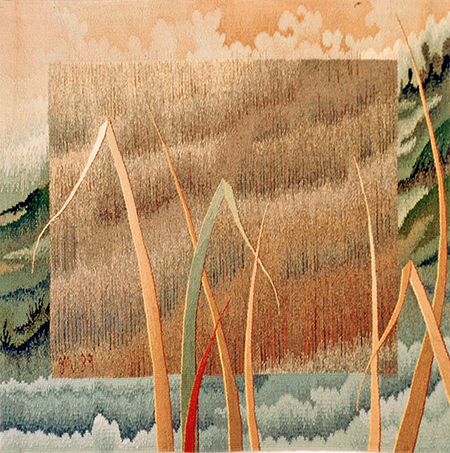 The frame and the image carry similar visual information, that of individual grasses being blown by a wind. Mitchell has carefully woven each blade of grass; each has its own size and palette, each bending over as though being blown from right to left. The irregular lines of grasses also offer a kind of text, to be read like words, just as their movement welcomes intimacy, inviting the viewer in. 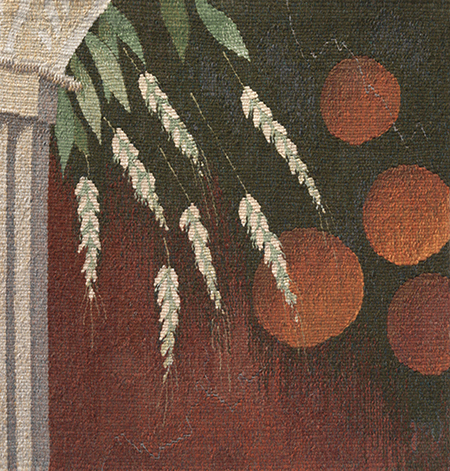 These grasses fill the whole of the tapestry except for a top and bottom strip of dark orange. That dark orange also forms part of what separates the center from the edges. 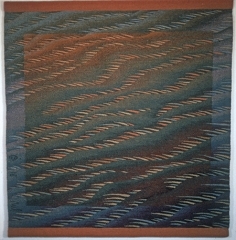 Overall, the effect evokes the rhythms of wind. A satisfying repetition of grass maintains its grass-ness in common with its fellows, and yet each blade remains individual. In another piece with a similar subject matter, Hills of Grass, Mitchell turns the idea of frames on its head. 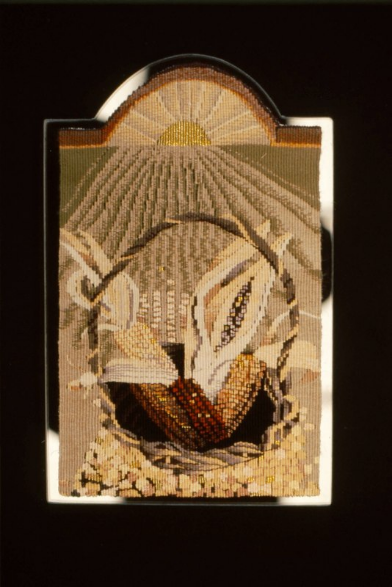 A frame in a tapestry can include specific images, or just echo the center. Here, the outside of the tapestry has, so to speak, the clearest subject, a landscape in which individual blades of grass push through a central block of undulating lines. Those lines, the center of the tapestry, suggest meadows of grass without being more specific. While enticing and welcoming the viewer into her rhythms, Mitchell also regularly maintains a narrative, the going from one place to another, that can read like a story. With these ideas in mind as the basis for analysis—narrative thrust as well as weaverliness—any of Mitchell’s tapestries can reward thoughtful viewing. Misty Mountain Field, one of Mitchell’s largest (24” x 108”), achieves an especially satisfying readability for the viewer who understands the nature of the weaving process: Mitchell had to have started on one of the short ends and continued to the other end. This process works much as a look at a landscape can work, moving one’s head from one point to another, as grasses and flowers emerge over a growing season. The warp provides the pathway for a sequence which the image follows, pick by pick. Mitchell’s constancy of subject matter, the natural world, includes both land and sea scapes. She pursues each tapestry, for all the repetition of subject, with individuality. 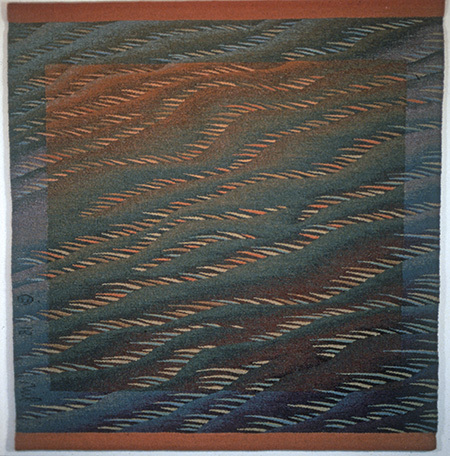 She has wondered at times, especially when she was studying at the California College of Arts and Crafts in the late 1960s and early 1970s, What’s wrong with me that all I really want to do is representational tapestry? This was, after all, a period when the fiber arts were exploding and the norm was to explore the materials and their limitations and natures in non-representational ways. But Mitchell’s own nature led her on a different path. Of late, though the landscapes and seascapes have continued, Mitchell has also pursued other visual agenda. Interesting to note she is fascinated by that which decorates an interior surface, a wall or a floor, just as a tapestry does. A quartet of pieces based on Roman wall paintings has permitted her to explore surfaces, especially when, as with these, the surface is distressed. Cave paintings too have gotten her attention as well as a group of nautical charts. In the charts, she explores her interest in borders with land masses that crowd the edges. 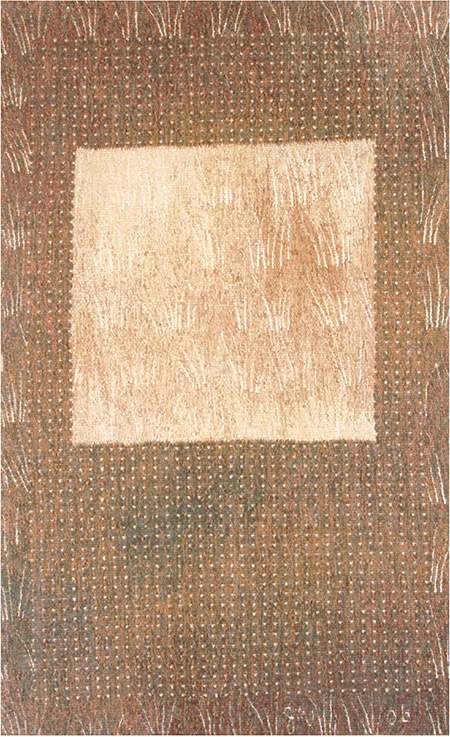 Her gallery on Martha’s Vineyard has always encouraged her to make rugs: these tend to be explorations of stripe and color. 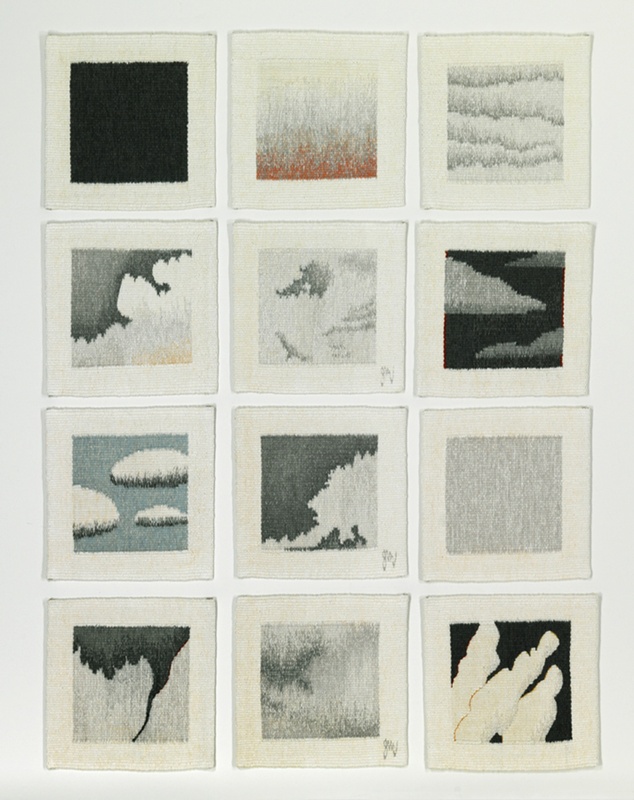 She has begun to focus on clouds as the subject, rather than one element among many. 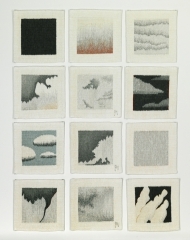 In a recent series of 12 tapestries, Clouds, each 12” x 12”, Mitchell has challenged sequence by proposing that these can be viewed horizontally, vertically, in a grid pattern, 3 images by 4, or however. Ultimately, they make a whole that can be changed constantly, with endless variables, a narrative with various twists and turns. 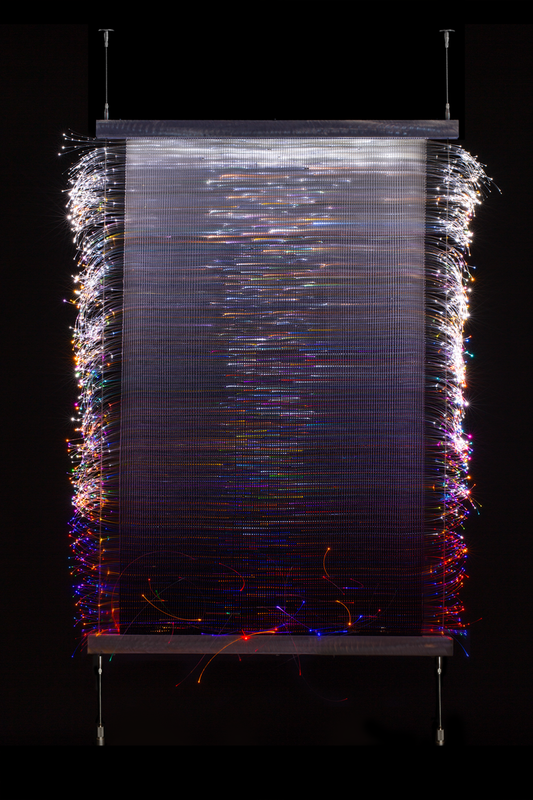 The willingness to try such an experiment speaks well for how Mitchell continues to find delightful and worthy variations, however unexpected, for her materials and techniques.